Gun Fight debuts tonight on HBO at 9:30 p.m. Eastern. There's a scene in Barbara Kopple's new documentary, Gun Fight, that more or less sums up the woeful state of public discourse over gun control. Two men stand next to each other outside the Supreme Court, furiously waving their picket signs. 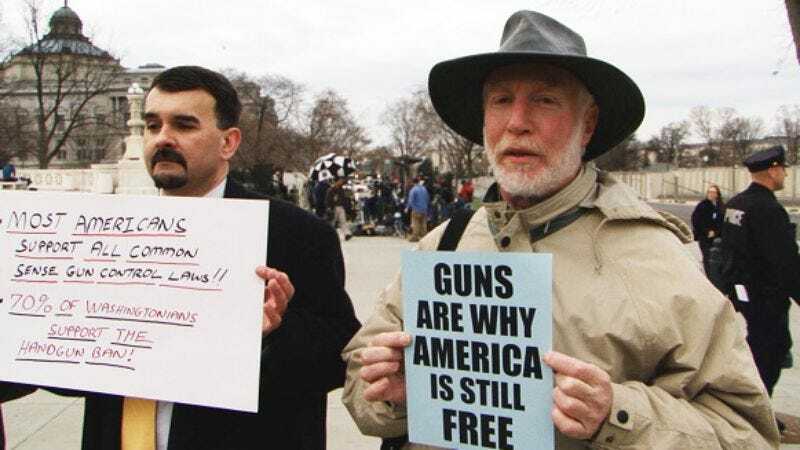 The man on the left claims that 70 percent of Americans own guns and support gun rights; the man on the right claims that 70 percent of Americans want tighter gun laws. One of the more discouraging things about the gun-control debate in America is that, over the years, it's been reduced to a set of platitudes and manipulated statistics. Gun Fight may do nothing to help mitigate such intractable partisanship, but at the very least, it will leave viewers thinking about the debate in new ways. The film has a loose and wide-ranging style, but Kopple focuses on three figures. Colin Goddard is one of only seven students from his French class to have survived the Virginia Tech massacre, and he now works for the Brady Campaign to End Gun Violence. Garen Wintemute is an ER physician who, tired of treating an endless stream of gunshot victims, began to conduct undercover investigations into the lax regulations at gun shows. Finally, there’s Richard Feldman, a veteran gun lobbyist whose defense of the “Subway Vigilante,” Bernhard Goetz, helped solidify the political influence of the National Rifle Association. Though he’s still a zealous advocate of gun rights—“Someone drives up the driveway, if I don’t know who they are, I’m going to greet them with a gun in my hand,” he boasts—Feldman distanced himself from the NRA after its opposition to voluntary child-safety measures enacted in the ‘90s. Kopple apprenticed with the Maysles brothers and, for a time, adopted their hands-off approach to documentary—as in her most famous work, Harlan County U.S.A. In Gun Fight, she uses a more mediated style that will be familiar to anyone who has seen a documentary in the past 10 years: There are the requisite talking head interviews, the local news clip used in lieu of narration, the ironic country music cues. It’s not the most formally inventive documentary ever made, but there are worse transgressions than accessibility. Despite the film's boilerplate format, Kopple is able to pull off some dazzling feats of storytelling. She has a way of initially withholding—then casually revealing—critical information about her subjects that makes their personal narratives all the more powerful. At first, Goddard is just a Virginia Tech survivor providing an eyewitness account of that terrible day. It’s only later that we find out he’s now a gun-control activist. Likewise, we don’t know that Feldman has actually fallen out with the NRA until we’ve just about concluded that he’s a complete zealot. One could argue that this is manipulative (“I never would have liked that Goddard kid so much if I knew he wanted to take my guns away from me!”), but I’d argue the opposite is true. Kopple treats her subjects as individuals, each of whom brings a unique set of circumstances to bear when it comes to the issue of gun control; they are not merely conduits for a political agenda. She’s as interested in the why of their beliefs as she is in the what. Rather than drive home her message with ham-handed juxtaposition (a la Michael Moore), Kopple likes to draw concentric circles. There’s a meandering quality to her documentary that belies its highly strategic structure. Near the beginning of the film, Kopple presents both sides of one of the more pivotal issues in the gun-control debate—whether guns, used effectively, could actually prevent tragedies like Tucson or Columbine. From there, Kopple suddenly drops us in urban Philadelphia. Two young black men, wearing masks to protect their identities, provide a guided tour of their house. There are guns everywhere, including a 4-foot long rifle bulging from under the couch cushions. It would be funny if it weren't so scary. Without the aid of narration, Kopple makes a strong argument that the outsize desire to protect the proverbial homefront—a belief most fervently held in rural and suburban America—has created chaos in the country’s inner cities. What's more, our fixation with bloody school shootings has, to an extent, blinded us to more quotidian gun violence. As an activist in Philadelphia says, referring to Columbine, "Thirteen kids? We do that here in a weekend." This is perhaps the most impressive element of Gun Fight: that it encourages us to look at the issue from another angle. In contrast to Michael Moore, Kopple largely avoids the thorny question of why Americans, as a whole, are so gun-crazy. The real villain of the film is not the American gun-owning public, nor the country’s gun manufacturers. Instead, Gun Fight places the blame squarely at the feet of the NRA. The organization, which has enjoyed virtually unimpeded legislative and judicial successes over the past 15 years, now has to, in a sense, justify its own existence. In the words of one journalist, “If its cause goes away, it goes away. They need a dragon to slay.” This means riling up the organization's constituency with the fear that the federal government wants to take away their second amendment rights, concerns that the NRA's very success ought to have dispelled. Kopple is likely to draw criticism for her liberal bias. There are scant few gun-rights advocates in the film who are not either cartoonishly belligerent, paranoid, or both. Likewise, Harlan County, U.S.A. was told through the eyes of the striking coal miners, not the coal company executives. Yet it’s Kopple's prerogative as a filmmaker to present her own point of view—and not to simply provide a platform for others'. Perhaps ironically, the most persuasive of the pro-gun arguments in the film comes not from a lobbyist or activist, but a Virginia Tech grad student who says that “the-second-to-last thing I want to do is shoot somebody. The last thing I want to do is die because somebody shot me.” Less convincing is an elderly gentleman who argues that Jesus Christ himself supported unrestricted gun rights. Gun Fight might not be balanced, but in the end, it is more than fair.